Choosing the color theme when you are planning a wedding in Italy can be a challenge – you may think you want a certain color scheme, then you might see a different one online or at someone else’s wedding and think to yourself that their idea for a wedding color theme would be perfect for you. It’s very important to stick to your color scheme once you’ve made the choice, as it’s such a vital part of your wedding plan. If you don’t know which colors to choose, begin with your bridal bouquet and work with the colors of your flowers – or use your favorite color and coordinate everything with that. The flowers are not the only part of your wedding that can be coordinated with your color theme; don’t forget about one of the most important components of your wedding outfit – your bridal shoes! Here we show you a gorgeous pair of green satin bridal shoes that any bride would be happy to wear to give a little extra ‘zing’ to her bridal outfit for a 2013 or 2014 wedding in Tuscany– but of course you can choose any color that makes you feel that little extra bit special – and which will delight your bridal party and guests… just don’t wear red shoes if your bouquet is pink! Heels or flat shoes? That will depend on the height of your groom! If he’s a little on the short side you don’t want to tower over him in 4-inch platform heels – and if he’s much taller than you are you certainly won’t want to wear flats and be dwarfed by him… so choose appropriately. There are shoes that can be dyed any color you wish or you can opt for shoes that are already the right shade and which will coordinate with your wedding color scheme. 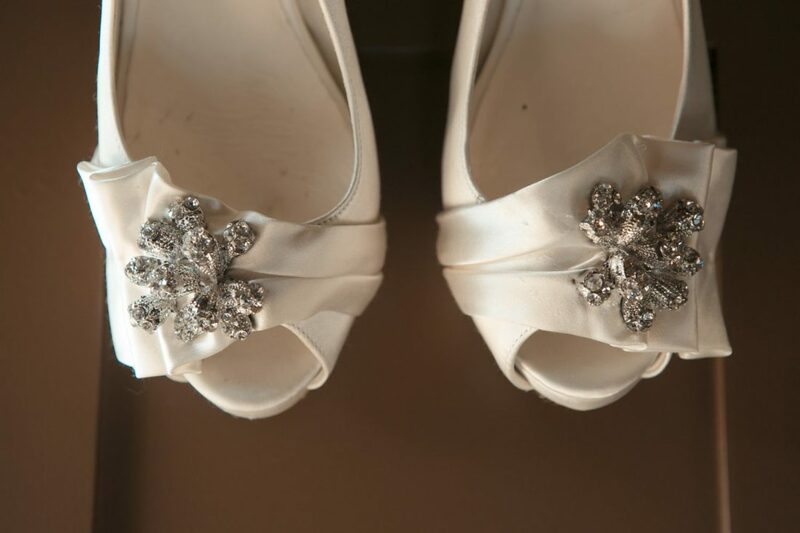 Have fun with your choice of bridal shoes – but don’t forget you’re going to be wearing them for several hours, so make sure they’re relatively comfortable!